Music of the Spheres: SpaceX Comes to Orbiter! I had been hoping for some time that someone would create Orbiter add-ons for SpaceX Falcon-series launch vehicles and for their in-work Dragon spacecraft. Last week I learned about a Falcon-9/Dragon add-on project by "Major Tom," currently in its third beta and making great progress (e.g., Dragon has animated solar panels, re-entry simulation, parachutes). Cool! His Dragon beta is shown here about to directly dock with the ISS. 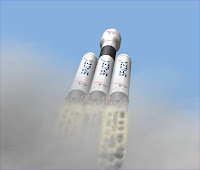 Then in typical feast-or-famine fashion, I learned on orbiter-forum.com today that another add-on maker "Glider" has an even more elaborate SpaceX add-on in the works. So far he has released the launch vehicles (Falcon 1-e, Falcon 9, and Falcon 9 Heavy, shown here just after launch, a real monster with 27 engines). 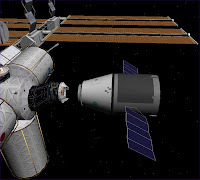 He plans to release his version of the Dragon (cargo and crew versions) later this week. Also cool! These are works in progress (though quite impressive), and I don't have time to play much with them for a week or so, but I'm really pleased to see this development, since if things go according to plans, the real hardware will be flying in 2008 and 2009 (at least F9 and Dragon, not F9-Heavy).